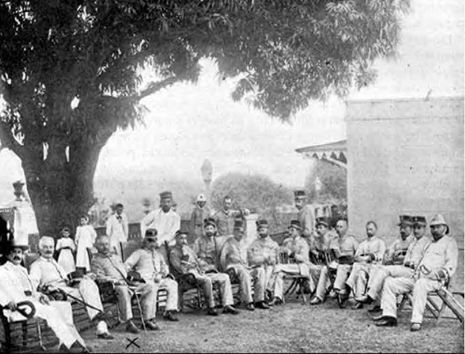 Brigadier General Theodore Schwan and 2,896 men of his Independent Brigade had landed in Guanica and marched towards occupied Yauco. Schwan and his men were ordered to move westward and to capture the city of Mayagüez. Colonel Julio Soto Villanueva ordered 1,500 Spanish Regulars of the 24th Rifle Battalion, six companies of the Alfonso XIII auxiliaries, and other scattered Spanish and Puerto Rican guerilla forces dispatched from the garrison at Mayagüez to meet and defeat Schwan. The Spanish forces entrenched themselves at a high ridge called Silva Heights, located at a road near the town of Hormigueros. Schwan's troops arrived in the town of San Germán and continued the march towards their objective. Troop A of Schwan's 5th Cavalry approached Silva Heights and were soon engaged in a firefight when the Spanish forces opened fire. The Americans were aided by two companies of the 19th Infantry, supported by artillery and Gatling guns, as well as the 11th Infantry. The Spanish forces retreated after the American reinforcements brought them under intense fire. Schwan's men set up camp on Silva Heights for the night and the following day they continued their drive to Mayagüez. They arrived the following morning to find that the Spanish forces had abandoned the city to retreat to the east towards Lares. Schwan did not follow Soto Villanueva, but instead was ordered to take the town of Las Marias. The outcome of the Silva Heights Battle left 3 Spanish dead, 6 wounded, and 136 prisoners. Schwan's brigade suffered 15 wounded and 2 killed in action. A considerable force of Spanish regulars and auxiliaries, encamped on the high ridge overlooking Hormigueros, struck Schwan's brigade on August 10, 1898, hoping to turn it back. Initially, the attack was successful, pinning the 5th cavalry in place and preventing the 19th infantry from reinforcing American positions. The Spanish lacked artillery support, however, and could not answer Schwan's Gatling guns and large-caliber cannons. As Schwan's brigade pressed forward, surging along the ridge's flank, Spanish numerical inferiority began to tell. Out-gunned, Colonel Julio Soto Villanueva ceded the heights to the American forces and withdrew his men east to Lares.